The Filipina hero of eccentric moves strikes again. Now at sweet 80 Imelda Marcos starts campaigning as congressional candidate for the national election on 10 May 2010. 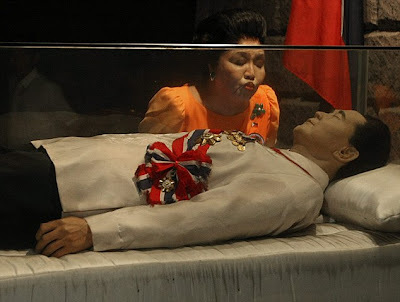 Her campaign began in Batac, Ilocos Norte, where her embalmed husband rests. Her trademark taste for the theatrical may bring her back into political life. I can’t wait for her next move when she brings Ferdinand out of his coffin to take the seat in congress together. Only in the Philippines as the locals would say. Photo from the net as I wasn't invited to the shamelessly political photocall held at the mausoleum in the basement of one of her homes up north in the Philippines.